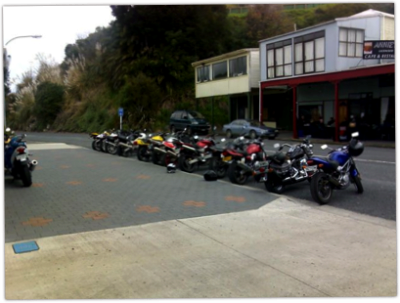 Last weekend, on Saturday the 19th on August I joined a few Kiwi Bikers and headed towards Kawhia. The ride there was quite an experience, as I have not really had the new Hornet anyway near a twisty road before. After a cold bundaberg, and burger at Kawhia, it was decided by the group to head south around the harbour, through some roads that other people knew about, and meet again at Waitomo pub. After 10 minutes of riding, and picking up a VTR1000 that had gone for a wee skid down the road, I seemed to find my rhythm. The bike was working well, and I was feeling good, and confident. The result was, in my books, a quick ride, and by far the quikest I have ridden the hornet. I followed some much more experienced riders, and learnt a few trick which I can’t wait to try again.